Love this dress from complexgeometries' spring collection. It has two of my favorite things; a hood AND it's racerback! Perfect. it would look great with a new hair cut! i have this dress, seriously one of my favorite things ever! i like the double tube t.
oh, i just read readysetfashion's comment - she's totally right! Your package came today! I was so exciteddddddd I started screeching and singing (not well, I'm afraid) and my mom's 6 year old guitar student looked at me like I was LOONEY. Which I am! The knee socks, the MAGAZINE (which I've looked through about 3 times since it came, btdubz) the lace! I love it all, and the card was beyond sweet. I love you! 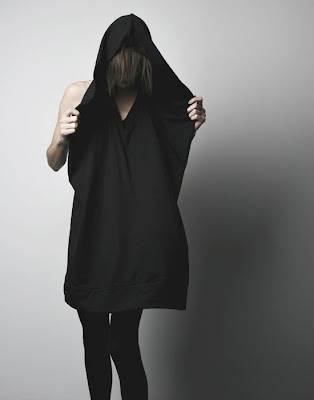 And this cape/hood/racerback thing is epic, reminds me of Yohji and would look superduper on you! I bought this in white. It's pretty stellar.